Live De Life Living in the USVI's: Only in De Islands "White Toyota With Bullet Holes $3700 STX"
Only in De Islands "White Toyota With Bullet Holes $3700 STX"
So while I was checking Craig's List here in he island this week I found this listing for a Toyota for sale on St Croix. The add would be unbelievable if it weren't for the pictures. Good thing they are small bullet holes. Here is the actual description from the ad. 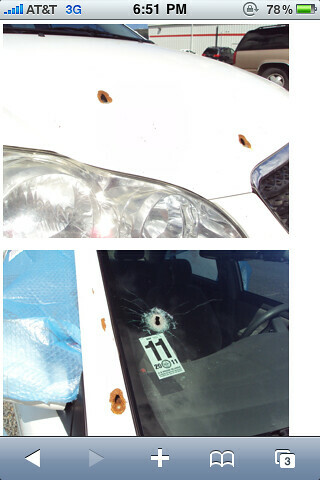 "The bullet holes are no big deal since they are only .22 caliber. There are 11 bullet holes. Inspection is good till Nov 2011, at which time it will need a new windshield. 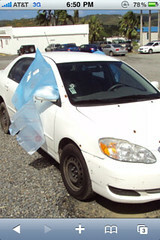 The two passenger windows are shot out. No AC. Automatic transmission, 184K miles. Located mid-island on St. Croix. Clear VI title. Runs good."